If you haven’t heard by now, Michael Kimball, who I also like to think of as a genie who broke through his own bottle, was recently inducted into the Guinness Book for International King of Postcards. 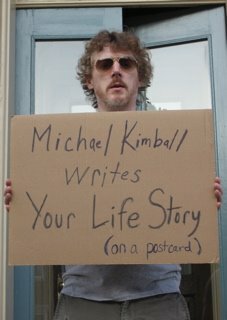 Over the past few months, Kimball has been working on a series of postcards in which, after speaking to his subject for a while, he condenses their life story into a text small enough to fit on the back of a postcard. Then he mails them the postcard. It’s a pretty peculiar experience, to receive this little piece of paper that encapsulates you into these amazing microwords, lanced by Kimball’s stellar, steady eye. Me, I can’t even draw a decent sketch of a dude’s head. The results, besides being in the mail, have been cataloged online at his postcard life stories blog. Among others, you can read, in less than a couple minutes, the lives of folks like Kim Chinquee, Adam Robinson, Myfanwy Collins, Josh Maday, Jen Michalski, and a wide range of people from out of nowhere. The scope of the thing is just kind of flabbergasting: Kimball as a filter for all these people’s years. I can’t imagine anyone else capable of such an undertaking. Oh, and besides all that, he just so happens to have also published one of the hottest, most innovative books of the year.